Mauerpark. Image by Paul Sullivan. Paul Sullivan: What were your first experiences of the Berlin Wall before you moved to the city? And how have your perceptions of it changed since you moved here? Paul Scraton: I’ve been thinking about this a lot recently, and one thing that keeps coming to mind is a children’s television show I saw at some point in the 1980s. It told the story of a teenage couple separated by the Wall. He lived in the West and would cross the border using the S-Bahn to meet her. I can still picture him staring mournfully out of the window. I was only ten then, but can also remember the Wall coming down on TV and watching thousands of smiling faces and a sea of stone-washed denim. But I don’t really remember having any sense of the Wall being an abomination, or an absurdity. It just existed, like a fact of life. Paul Sullivan: When did you eventually come to Berlin? Paul Scraton: I first came to Berlin when I was twenty-two years old (2001), and moved to the city within a couple of months of that first visit. In a way it was the Berlin Wall, insofar as it was part of the overall fascinating history of the city, that brought me here in the first place. During my first few days here I went to the East Side Gallery and Checkpoint Charlie, and began to pick up books to help learn more about it all. As time has gone on, my interest has shifted from understanding the history of the Wall to what its traces and remains signify, i.e. the Mauerweg, a 160km memorial, transport link and place of recreation all at the same time. You also grew up in England. Do you have any early memories of the Wall? Paul Sullivan: I remember seeing the same denim-clad celebrations on TV, but I don’t recall feeling in any way “involved” in them. I was 17 then and had other things on my mind than Cold War politics! Interestingly, when I do scour my mind for specific memories, I am not sure what’s real and what’s been ‘imposed’, in the sense of the intense amount of film footage and photographs I’ve absorbed since. When I first visited Berlin, in 1999, I definitely didn’t have a grip on what the Wall really represented, or how it was still in many ways dividing the city. But I remember standing on Alexanderplatz in horribly bleak winter weather and thinking “so this is what East Berlin must have felt like.” I was here to write a music article, and I interviewed some musicians living in the city’s Plattenbauten, and artists who had grown up in the former East like To Rococo Rot; these experiences and stories began to define what the wall was and meant. But when I came to live here in 2008 I still didn’t exactly know which parts of town were East and which were West as I hadn’t properly studied a Berlin Wall map. Of course it wasn’t very long before I realised that it was fundamentally important to do so – evidence itself that the Wall still existed, and exists, in a very significant and contemporary way. Your partner, Katrin, grew up in East Berlin, right? East Side Gallery. Image by Paul Sullivan. Paul Scraton: Yes, she was born in East Berlin, and lived the first ten years of her life in the GDR. One of the first things she told me about herself in 2002 when we met was that she was an “Ossi”. After that I began to notice, and be surprised, about how many Germans I met still defined themselves by whether they were from the East or the West, and along the way I also learned some of the prejudices and stereotypes. That was over ten years after the Wall fell, but maybe it was not such a surprise. Things change though, and it was something of a shock when I asked a colleague of mine a few years ago and she replied, “Well I was born in Potsdam, but it was 1990…” and I realised that my partner’s generation, just about old enough to remember the GDR, will be the last that still make the distinction. Paul Sullivan: Did you live in the former East when you moved here? Paul Scraton: Yes, for about eight years we lived in Mitte, around the Zionskirchplatz. At the bottom of my street was the Bernauer Strasse and the little line of cobblestones that signified the route of the Wall. Even now crossing from one side to the other is like moving between two different cities – the architecture, the people on the street, the atmosphere. In 2010 we finally ‘crossed the border’ ourselves, to Wedding. My partner was in her early thirties and it was the first time she had lived in the “West”; and the fact that this was even noticed, let alone commented upon by ourselves and within family and friends, says a lot about how that line of cobblestones still represents a significant division both in people’s perceptions but also in reality. Paul Sullivan: How come you ‘defected’ to the West? Paul Sullivan: Yes, around the Helmholtzplatz in Prenzlauer Berg. My partner, Kirstin, is from North Rhine-Westphalia, which means I now live in the former East with a Wessi and you live in the former West with an Ossi; an interesting mirror. The fact that Pberg was former East was definitely part of its appeal when we moved here in 2008. Our first couple of years exploring the city definitely involved investigating the traces and ghosts that ‘haunted’ our district. In fact many of them materialised very quickly, such as the lady who lives downstairs, who is very pleasant but also a little mentally unstable and in an on-off relationship with an alcoholic partner we’d quite often find passed out on the stairs in pools of his own urine and smashed booze bottles. We found out a little later that she was one of the ‘lost souls’ from the Mauer era, from the period of transition, who had lived in our house before the Wall fell but couldn’t really deal with the aftermath. Whenever I see her, which is often, I cannot help but see her as a victim of the division. It’s very sad. Friedrichstrasse S-Bahn station used to be a border crossing and the last station before West Berlin from the east. Image by Paul Sullivan. Paul Sullivan: Yes. I became very curious about the tension between its current reputation as yuppified and boring, and its dynamic, colourful past as a working class enclave dominated by breweries in the late 19th century, then one of the principle hubs of counter-culture in the GDR era. I spent – and still spend – a lot of time reading about the area as well as stalking the streets to find marks, traces, characters, stories, memorials, surprises. It’s interesting how past and the present interact; how these stories from long ago (and not so long ago) can inform the environment around you and make it more meaningful. It’s a bit like being a detective I suppose, but it pays off. Paul Scraton: Yes. 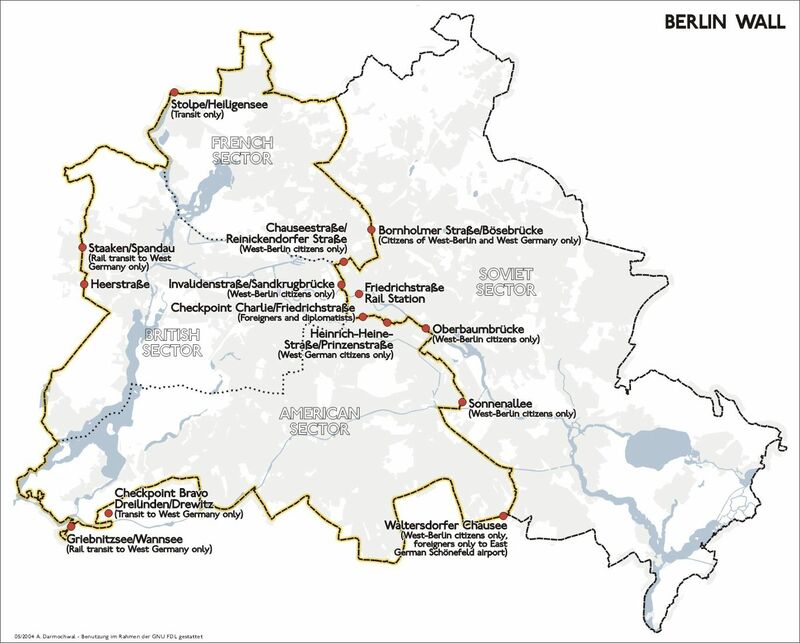 I was amazed, in researching the Wedding neighbourhood tour (which is run in conjunction with Slow Travel Berlin of course), how the post-war division of Berlin and the Berlin Wall shaped and continue to shape our neighbourhoods. For example, the collapse of industry in Wedding as companies moved to more secure locations in West Germany, or the fact that much of the immigration to West Berlin was needed to fill jobs that had once been occupied by East Berliners who crossed the sector borders each morning and evening and then, after a weekend in 1961, found their way to work blocked by barbed wire and concrete. Something like 50,000 East Berliners worked in West Berlin, and someone had to come and do their jobs when they were no longer able to. Paul Sullivan: You just started a new website/project too, called Traces of a Border. What is that about, exactly? Bernauerstr. Wall Memorial. Image by Paul Sullivan. Paul Scraton: It specifically explores the Berlin Wall Trail (Mauerweg) and the history and legacy of the division. This involves walking the trail all along its 160 kilometre length, and not just the more famous stretches through the city but also where (West) Berlin meets the countryside, and the edgelands and the suburbs. I think walking the trail not only helps give an understanding of the events of the past, but also is a means to understanding the contemporary city. The trail is a starting point, and it has already led me to ask a number of questions, about how we deal with sites of memory, about the continuing development of the city, about public space and access…And then there is the legacy of the Wall for Berliners, those who lived with it and now live without it, even if the division continues to have an influence on the city and therefore peoples’ lives. Paul Sullivan: Yes, one of the abiding curiosities for me is not so much how us ex-pats perceive the wall, which is necessarily distanced, but those who grew up with its stark reality, especially the older generation, and particularly those from the East. I often find a pretty wide disparity between the things I read, watch or experience about the wall, which tend to focus on the more dramatic and brutal side of the regime – and those who grew up there, who often say it was fine, or sometimes even say they miss it, or aspects of it. I took a cab ride the other day whose driver had lived pre- and post-wall in Berlin. As we drove through Alexanderplatz I asked him if he remembered the old Markthalle that used to be there. He said he used to go there all the time. When I asked him what he missed, he said “nothing”. When I asked him what the worst things about those times were he shrugged and said “nothing” again. Likewise the ZZB eyewitness talks at the Circus, which are fantastic and important, sometimes involve more “dramatic” experiences, though they are more often than not ‘balanced’ with more everyday or at least less sensationalised descriptions of how it was to live under these conditions. Bernauer Strasse in 2012. Image by Paul Sullivan. Paul Scraton: From a German perspective, I think there was a feeling – especially for many from the East – that the GDR was simply swallowed by the Federal Republic; that everything that came from the East was seen to have been bad, and that they were basically told that everything they experienced up to now was to be thrown in the trash, and de-legitimised by the crimes of the Stasi and the SED, which were of course very real. And actually, when you speak to people who lived in the East, whether at the Circus talks or otherwise, you are reminded that in the main people did as they do everywhere; they work, they fall in love, they have children, they drink a beer at the end of the working day, and they make the best of it. Nothing romantic, nothing to be nostalgic about, but just the reality. Paul Scraton: I think in general it is correct that people do not “head for the Mauerweg”, but with a couple of exceptions. The open-air displays of Bernauer Strasse you mention, which includ murals, information boards and the Memorial and Documentation Centre itself, are a stretch of the trail that certainly gets a lot of foot and bike traffic, and would actually be my first recommendation for anyone interested in the topic. It is extremely well done. The other, interestingly, is probably a place where many visitors do not even necessarily realise they are engaging with the Berlin Wall Trail: the Mauerpark. They come for the flea-market or the karaoke or just to drink beers on the hillsides – and yet they are experiencing the legacy of the Berlin Wall in the sense that they have this space, this scruffy but much-loved place of recreation, that was once the death strip. The moment you realise that, you get a sense of how powerful the Mauerweg is not only as a memorial but as a place of leisure, as a communal and shared space. It also makes the debates over the future of the park – not to mention the stretches of the trail at the East Side Gallery or down in Griebnitzsee, where access to the path has been blocked by the homeowners along the lake – all the more important. A train passes between Schoenhauser Allee in the former East and Gesundbrunnen in the former West. Image by Paul Sullivan. Paul Scraton: Very true. What motivates me – for Traces of a Border as well as developing the Hike the Wall tours for Slow Travel Berlin – is that we engage with these places and spaces, not only for what they once were but for what they are now. As I said earlier, I am as much interested in what “walking the Wall” can tell us about the contemporary city, of divided communities, of gentrification, of how we manage our sites of memory or the wildlife that now occupies the former fortifications, especially on the edge of the city. The history is interesting of course, and I guess that is the level with which most first time visitors to Berlin will engage with things like the Mauerweg or Zimmerstraße or the Bösebrücke etc. but it is how all of that has shaped, and continues to shape Berlin, that makes it all the more fascinating. And that’s also why I would urge anyone with an interest in the topic to take an afternoon and follow the trail, just for an hour or so. Take the time to look closely at where the division remains obvious, but also where the city has come together again. Paul Sullivan is a Berlin-based writer & travel photographer and the founder/editor of Slow Travel Berlin. You can check out his Facebook page here and his photography galleries here. Or you can follow him on Twitter. Paul Scraton is the founder and editor of the Under a Grey Sky website, which is devoted to “adventures beyond the front door”. He has lived in Berlin for over ten years, has a Master’s degree in International Studies, and amongst other activities writes for Slow Travel Berlin, runs the Wedding and Berlin Wall walks for STB, and organises the Eyewitness History Talks in cooperation with the ZeitZeugenBörse at the Circus Hotel. His latest project is Traces of a Border, exploring the stories and the places to be discovered along the Berlin Wall Trail. A harrowing collection of works by one of Germany’s most acclaimed female artists. An excerpt from a forthcoming book on Kurt Tucholsky’s time in Berlin.